Its position should be 1.5-2 meters away from the ground, and the light should be projected from the upper left as far as possible. This conforms to the position of the light when the painter paints, but it can not be glass-inlaid. The length and width of the nails should be considered according to the furniture after the drawing board. The frame is selected in proportion to the size of the drawing. The frame color corresponds to the furniture color or is similar to the painting tone. Golden Section is the best point of view for hanging pictures, which can solve the problem of hanging pictures hesitation. The function of living space determines its use function and mode, and the use of function and mode combined with decorative art is the complete beauty of interior design. Bedroom is suitable for emotional communication with people or close subjects; children's bedroom is best for abstract paintings of children's subjects; living room is mainly landscape, making the environment more open and clear; while restaurant can hang some still life of sparse fruits and flowers, which can enhance people's appetite. Local style should be coordinated and subordinated to the overall style. 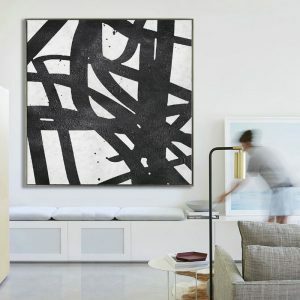 Black and White Abstract Painting is the highlight of interior decoration. It should have the beauty of harmony with interior decoration as a whole. 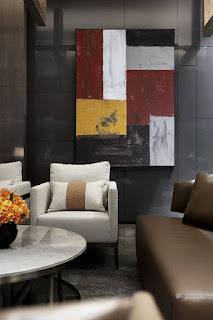 Abstractionism and modernism are concise and fast, which are more suitable for spacious and bright space, new decorative style and novel materials; realistic and classical style is suitable for luxurious and elegant decorative style; impressionist painting style, whether in corridors or bookcases, can reflect its colorful, glossy effect and has strong decorative characteristics. Oil painting can play a key role in interior painting. Colorful rooms can choose oil paintings with strong contrast; warm and elegant rooms should consider works with soft colors. The contrast of the hue of the oil painting and the hue of the room can better reflect the decorative meaning of the oil painting, but the color of the painting also corresponds to furniture and soft ornaments, and has the rhythm of the same color system. If conditions permit, customers can be advised to consider both decoration and investment. Original oil painting is a collection with stable investment and quick returns. The collection of original oil paintings is the embodiment of identity, taste and accomplishment. It's a double whammy to be able to select works with appreciation potential on the recommendation of experts. How to pick Contemporary Wall Art ?It does not take best to opt for the exact same type of decorative paintings in the interior, You may also occasionally use one or two totally different styles of decorative paintings as decorations, such as decorative paintings are particularly conspicuous, while the particular style is extremely obvious, along with a strong visual impact, then you'd better match up the style of home furniture, sofa and so upon. Oriental rugs are a stalwart of the living room, study and den. 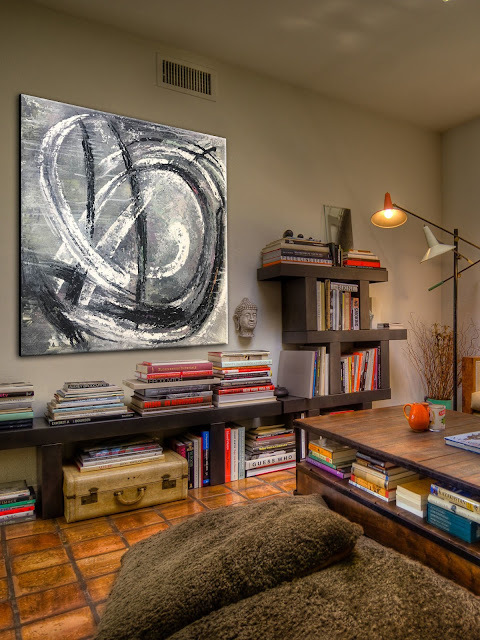 contemporary wall art It's a look I really like, (heck, my own family room has one! ), but in less likely environs, the rugs are similarly if not more compelling. Consider throwing a rich rug of reds and blues down in the kitchen, bedroom, however, bathroom, for a classic try an unexpected setting. one. Oriental rugs are godsends for heavily trafficked areas; contemporary wall art the rich colors and intricate patterns make them great at hiding unsightly stains. 2. Light walls open up up this small visitor bedroom, while the area rug grounds the space and sets the color colour scheme. 3. Switch out a uninteresting bath mat in favor of something with a little more weight and personality. 4. Notice the number of of these rooms pair the area rugs with bright white? This cools down the rugs' tones and make for a more modern aesthetic. Contemporary wall art- Jan van goyne's landscape was more mature in the late 1750s. Then he looked more carefully at the river landscape of his country,Large Canvas Art with more beautiful moments in his chest. were produced during that period. This painting of the Rhine near ertin is another masterpiece he completed in 1655. It marked the distinct character of goyne's landscape paintings on the river. The vast Rhine river appears in the painting with an infinite sense of space. With thousands of ships passing through the main waterway each day,Black and White Wall Art the busy traffic signals the growing industry and manufacturing in the vicinity of edin in the Netherlands.